Most parents love giving their baby a bath. It keeps them clean and healthy while promoting bonding. Bath time is important, but it's equally important to make sure your baby stays warm right after they're done soaping up. Allowing your baby to get chilled after their bath puts them at serious risk for illness. We've compiled a list of the 5 best hooded towels for babies so that you can keep your baby warm and cozy after every bath. Why does my baby need a hooded towel? You might think that any towel will do for drying your baby, but their sensitive skin deserves something made specially for them. Choosing something designed for a baby's needs is the surest way to keep them happy and healthy after bath time. During their first year of life, babies are especially susceptible to colds. Their heads especially need to always be kept warm. A hooded towel ensures that your baby's head doesn't get cold while they're drying, and also provides comfort. This is especially important for babies that were born premature. Cotton: This material is a classic choice, known for its softness and good absorption. It also tends to be more affordable than some other options. Look for organic cotton if possible. Cotton/polyester blend: This blend is very common in baby towels and is probably the cheapest of all. It's generally comfortable and safe for infants, but babies with extremely sensitive skin might experience irritation from the polyester. Bamboo: Recently, bamboo baby towels have become very popular. The material is exceptionally soft and absorptive, making it ideal for babies. It tends to be a bit pricier than the other options, but many parents find it's worth the price point especially for babies with particularly sensitive skin. A towel with a high absorption rate is essential to effectively dry your baby. Drying them quickly reduces the risk of a cold. In general, a good baby towel will be at least twice as absorptive as a standard towel that you might use. If possible, opt for a towel made from organic material. 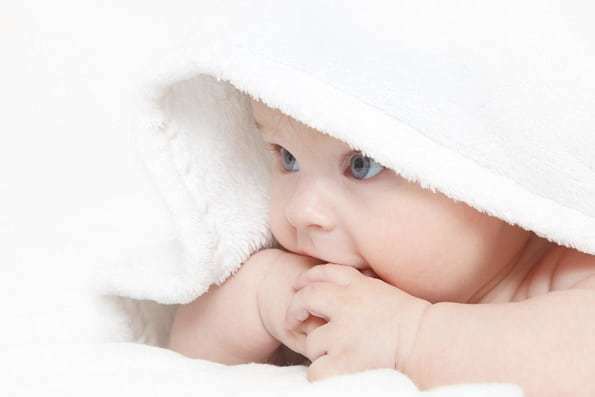 While they tend to be somewhat more expensive, organic towels are super-safe even on the most sensitive baby's skin. On top of being made of baby-safe materials, the towel you choose should be free of perfumed fragrances. Most baby towels average between 30x30" and 36x36". Any size is fine, but choosing a larger size will make it suitable for your baby even as they get a little bigger. It's better to have a towel that's a little bigger than have one that's not big enough. Made from 100% organic bamboo, this hooded towel from Bambi is made for your baby's ultimate comfort. It's four times more absorbent than cotton, so moisture is quickly wicked from your baby to ensure that they stay dry and warm. The organic bamboo is free of all chemicals, pesticides and perfumes. It's naturally hypoallergenic so it's safe for even the most sensitive baby's skin, even if they're prone to eczema, acne and other skin conditions. It's also naturally bacteria resistant, so it won't trap and grow bacteria even with regular use. At 34 x 34", it's the perfect size to keep your baby or small toddler cozy after bath time. It's a gender-neutral white color, and the adorable hood is outfitted with bear ears. It also comes with two washcloths of the same material, each measuring 12 x 12". NaturCute's hooded baby towel is made with a blend of 70% bamboo and 30% cotton for a plush, soft feel. It's exceptionally absorbent and soft enough for even the most delicate skin. This organic towel is hypoallergenic and bacteria-resistant, so it resists odor and keeps your baby's skin healthy. It's perfect for babies with sensitive skin or skin conditions. Free from chemicals and perfumes, this towel is 100% baby-safe even for the most sensitive skin. The towel measures 30 x 30" so it's slightly smaller than the Bambi towel, but it's suitable for most babies. The hood is embroidered with an adorable teddy bear design. It's available in three colors: yellow, pink and blue. As a bonus, the towel comes with six 10 x 10" baby washcloths made of the same material. Somewhat small, measuring 30 x 30"
Danibaby's premium hooded towel is made from 100% bamboo for exceptional softness and absorbency. 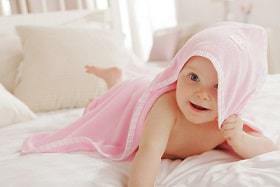 The soft material wicks away moisture quickly to keep your baby dry and warm immediately after coming out of the bath. Because it is made with 100% bamboo, this towel naturally resists odors, mold and mildew. It's anti-bacterial and breathable, so it won't house harmful bacteria that can harm your baby's skin. At 35 x 35", it's the largest towel on our list. In fact, it's large enough that many customers actually use the towel for their toddlers, who love the soft material after bath time. The towel comes in two different designs: white and gray with stars, or white and pink with hearts. It's also easy to take care of; when it needs a freshening up, just toss it in the washing machine and tumble dry on low. This adorably designed towel from Little Tinkers is made from 100% natural premium cotton. The cotton fibers are fluffy and extra soft to keep your baby comfy and warm. Since it's all natural, this towel is suitable for babies even with sensitive skin. Parents loved that it's soft and absorbent, and say that it gets softer with continued use. At 30 x 30", it's not as large as some of the other towels on our list, but it's suitable for newborns through small toddlers. A fun and playful elephant design will have your baby looking forward to bath time. The 3D trunk and ears turn bath time into play time. Its gray and yellow design is gender-neutral and soothing. Throw it in the washer when it needs to be freshened up, and tumble dry on low. Parents loved that the towel is durable and held up well even with regular washes. Brooklyn Bamboo is known for making baby products of exceptional quality, and their hooded towel is no exception. This thick, plush towel is made from 100% organic bamboo that's sure to keep any baby comfy and warm after bath time. The hypoallergenic bamboo fiber is suitable for your baby's sensitive skin, even if they're prone to skin conditions. Free from all chemicals, dyes and perfumes, it won't cause rash or irritation. It's close in size to the Danibaby towel, measuring at 34.5 x 34.5", so it can be used for newborns through toddlers. The main body of the towel is white, and it's available in three different trim colors: blue, pink and white. The hood is embroidered with the Danibaby logo, and some parents noted that the back of the logo is scratchy and irritated their baby's skin. For easy care, it's machine washable in warm or cold water. It can be air dried or tumble dried on low. Unfortunately, some users found that the towel's lining started to come undone after a few washes, so it is advisable to wash on a gentle cycle and air dry. The Bambi Luxury hooded baby towel combines the best materials with an adorable bear-ear design for a towel your baby will love. Made from 100% organic bamboo, it's exceptionally absorbent and gentle on your baby's skin. It's the perfect size for babies from newborns to toddlers, and durable enough to use for years as your child continues to grow.